In our other blog posts we’ve talked about the “no reverse” transmission fault that is common to the BMW A5S-325Z automatic transmissions, manufactured by ZF (also known as the 5HP-19) used in various early through mid 2000s 3, 5, X and Z models with the M54, M54TU and M56 6-cylinder engines. In this case, the loss of reverse gear (and the ability to move the vehicle in reverse) is due to a broken D-clutch drum. This is a core internal part of the transmission and requires a full tear-down to repair. This fault is unique to the A5S325Z and does not affect the A5S360R or A5S390R transmissions (manufactured by General Motors and also known as the 5L40E and 5L50E) that were also used in these same models, as well as earlier productions (late 90s through mid 2000s) of these models. See the link below for more info on the no-reverse fault with the ZF A5S-325Z transmissions. Continue reading this post for the no-reverse issues on the GM A5S360R and A5S390R transmissions. Oddly enough, the “other” automatic transmission that is used in the 3, 5, X and Z models from the late ’90s through the mid 2000s, is also susceptible to a no-reverse fault. However, the cause of the loss of reverse is fully different from that of the A5S-325Z. In this case, there are three common faults that can cause a loss of reverse. All of the issues are located within the transmission’s control valve-body vs. the main transmission internals, such as clutches and drums. These issues can all be repaired without removal of the transmission. The three issues are noted below. We have included some steps that you can follow as a knowledgeable DIYer. There are a series of specific flow and pressure tests that can be performed that will isolate and identify these actual faults, but only a properly equipped (and knowledgeable) transmission service facility can perform these tests. We would suggest that in all cases of a loss of reverse that you first try replacing the TCC solenoid and performing a fluid and filter change. If this does not cure the no-reverse, you can consider going further as noted in the steps below, or locate a shop that fully understands the valve-body diagnostics …. as opposed to a parts replacer that just wants to replace the transmission. The TCC control solenoid outlet filter breaks and the small parts can migrate to the reverse lockout valve bore and jam the valve in the lockout position. In this case, the repair is to replace the TCC solenoid and clear the broken filter particles from the reverse lockout bore and valve. At a minimum, the reverse lockout valve should be removed and the bore flushed. In some cases, the valve-body will need to be removed as well (and fully dissasembled and/or flushed) in order to assure that all of the broken filter particles have been removed. Before removing the valve-body or the reverse lockout valve, remove the TCC solenoid and inspect the end of the solenoid to see if the filter is intact. If it is missing or broken apart, replace the TCC solenoid and test to see if reverse function has been restored. If still no reverse, clean the reverse lockout bore and valve as noted above. If the filter looks fine (just like a new one), go to fault #2 and #3, below. Valve-body system pressure leakage (fluid) can cause the TCC or reverse lockout valves to move in their bores so that the reverse lockout or TCC valves prevent reverse function. This leakage can be due to worn valves, valve bores, valve-body seals, oil pump and the TCC control solenoid. In this case, the only DIY that we have available to us is to just replace the TCC solenoid, as this is a common cause of leakage when the solenoid is worn. If this does not cure the issue, further system pressure leakage and valve function testing is needed. 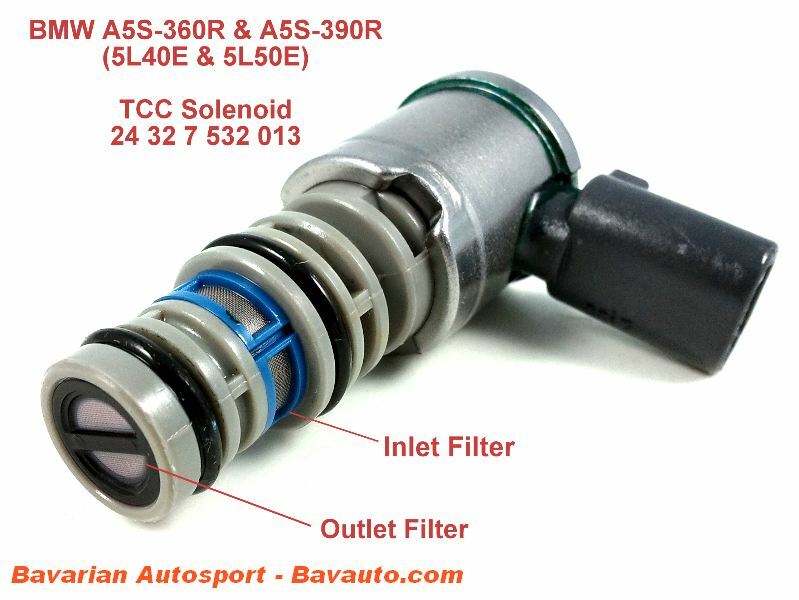 The intake filter on the TCC solenoid can clog due to inadequately serviced transmission fluid. Remove the solenoid and inspect the intake filter. Is it clear or does it have sediment or other solids on/in it? If yes, replace the solenoid and perform a filter and fluid change. If this cures the no-reverse issue, plan at least one more fluid change in the very near future, in order to achieve a higher ratio of fresh fluid. The TCC Solenoid is located on the forward end of the valve-body, on the left side (driver side on left-hand drive vehicles). Access the solenoid by removing the fluid pan and filter.